Though the gnollish Yeenoghu has been a familiar figure to players of Dungeons & Dragons for decades, he has had surprisingly little presence in D&D adventures—until now. Featuring eight classic demon lords brought to the dank realms of the Underdark, the Rage of Demons storyline season presents a new look at the once-powerful Demon Lord of Gnolls. The demon prince Yeenoghu made his debut in the AD&D Monster Manual (1977), which named him “one of the most powerful and most feared” of the demon princes—a ranking that would be unceremoniously chipped away at over the years that followed. Yeenoghu was pictured with a hyena’s head, befitting his position as the “Demon Lord of Gnolls,” even as he was also worshiped by “the King of Ghouls.” Like all the coolest demon lords, he had a special weapon: a three-headed adamantine flail. Yeenoghu’s dual nature as a ruler of gnolls and ghouls is probably why he was elevated to the top tier of demonkind. However, it’s his connection to the gnolls that has always stood out. When those creatures first appeared in the original D&D box set in 1974, Gary Gygax described them as a “cross between Gnomes and Trolls.” He also acknowledged their origin in the works of the Irish fantasist Lord Dunsany, who wrote “How Nuth Would Have Practised His Art upon the Gnoles” as part of The Book of Wonder (1912). Gnolls only attained their modern hyena-like appearance in the Monster Manual—the same book that introduced Yeenoghu, their lord. As with most of the classic demon lords, Yeenoghu’s home base was briefly described in AD&D’s Manual of the Planes (1987). He was said to have a mansion extending across multiple layers of the Abyss (though these extensive holdings would not last). Also like most of the original demon lords, Yeenoghu made a brief appearance in the adventure The Throne of Bloodstone (1988). Because his gnoll servants weren’t deemed dangerous enough for high-level adventurers, they fled if characters threatened Yeenoghu’s lair . . . leaving the party to fight one hundred Type IV demons instead. 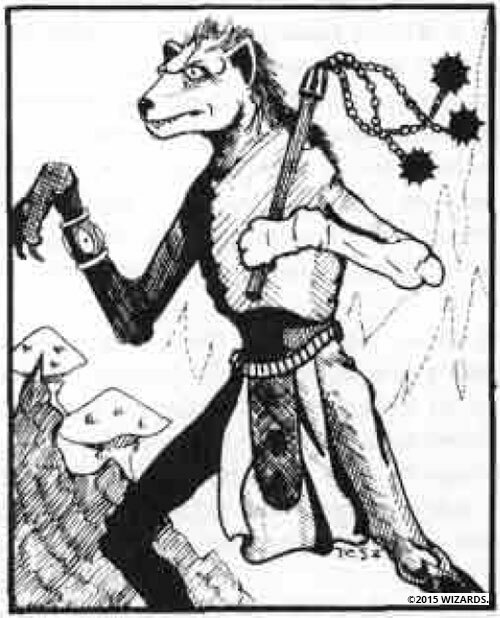 Yeenoghu had one moment of glory during the AD&D era in the Monster Mythology supplement (1992). There, he was described as a lesser god who had supplanted the former deity of gnolls, Gorellik. His home base was reduced to just one layer of the Abyss, which the Planescape supplement On Hallowed Ground would later define as the 422nd layer, the Seeping Woods. Yeenoghu has continued to appear in a scattering of books in more recent years, but his power level has slowly declined. 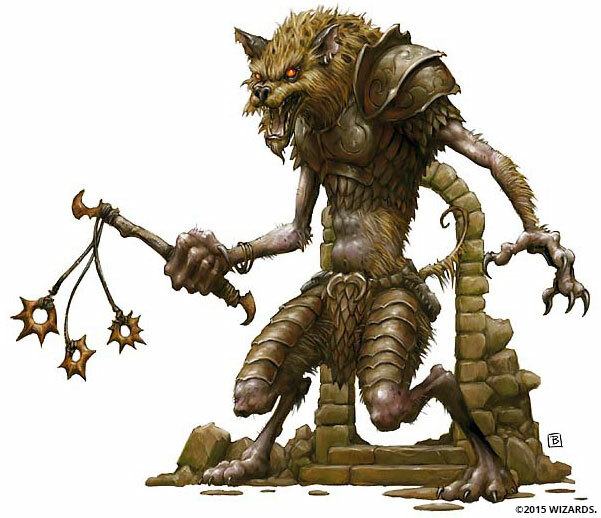 Though he was one of just five demon lords featured in 2002’s Book of Vile Darkness for third edition D&D (in which he was described as “very powerful”), the gnoll lord was acknowledged to be less formidable than Demogorgon and Orcus. That supplement also explained the mystery of the reduced status of Yeenoghu’s abyssal holdings, saying that he had once ruled both his own layer (now called “Yeenoghu’s Realm”) and the layer of the King of Ghouls, but that he was unable to hold the latter. Yeenoghu was somewhat revitalized in Dragon 364 (June 2008), which reimagined him for fourth edition’s World Axis cosmology. Receiving an extensive description in the “Demonomicon of Iggwilv” article in that issue, the gnoll lord became a cruel and savage destroyer known as the Beast of Butchery. Like most World Axis demons, Yeenoghu was also a former primordial in this vision of the D&D universe. Now Yeenoghu is back for the Rage of Demons storyline season, and making his first-ever major adventure appearance in Out of the Abyss. Still a hunter and a ruler of gnolls, the demon lord’s initial appearance in the adventure sees him fighting tooth-and-claw against his ancient adversary, Baphomet—with the adventurers caught in the middle. Shannon Appelcline has been roleplaying since his dad taught him Basic D&D in the early ’80s. He’s the editor-in-chief of RPGnet and the author of Designers & Dragons, a four-volume history of the roleplaying industry told one company at a time. D&D Extra Life Team Returns, Levels Up! Wizards of the Coast announces participating members of its Extra Life team, along with some donation incentives. Orcus was one of the first rulers of the Abyss, and has proven one of the most popular demon lords over the years.